It was a varied couple of days in the studio this weekend. I spent time working on an etching (printing and aquatinting) and did some layout and design on a leaflet for a friend who’s just going into business; two quite different activities. I also threw some painting into the mix. 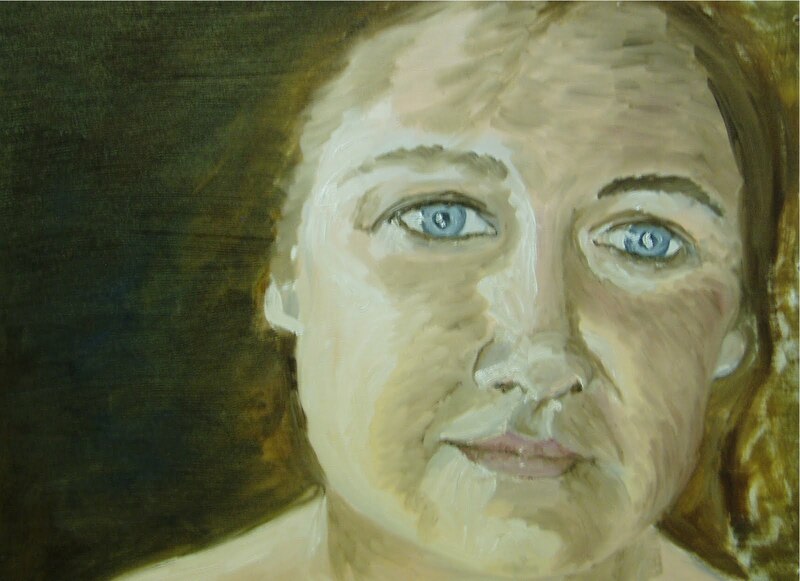 A big box of oil paints and gesso arrived on Friday, so on Sunday, I started a self portrait (24” by 18”). It was a very interesting experience. I don’t like what I produced but considering it’s been about 23 years since I last painted (and never in oils), it could have been a lot worse! A portrait was maybe a little ambitious to start with but it’s what I’m drawn to (pardon the pun). My etchings are predominantly monochrome so using colour will be good practice for me. I enjoyed the freedom and immediacy of mixing the paint and moving it around on the gessoed surface, being able to build up layers so quickly. The etching process takes so long – which I quite enjoy – but it made a pleasant change to be able to work swiftly with the paint. Even though this was very much a practice piece, I want to work on it some more, playing with colour and light and dark. I was surprised to find this afternoon that most of the paint is dry already, just two days after it was painted. I was expecting it to take much longer. My knowledge of the technicalities of oil painting is virtually non-existent so steep learning curve ahead.